The hypercar being developed to succeed the incredible Ferrari Enzo as the Italian sports car makers flagship car has been referred to as the Ferrari F150 while others have speculated that it would be called the Ferrari F70. In either case, information leaked from a recent invite-only viewing of the new halo sports car indicated that the F150 will be powered by a V12 engine that produces 800 horsepower while a hybrid Kinetic Energy Recovery System (HY-KERS) adds an additional 150 horsepower for a total output. Those specs sound incredible but do you know what sounds even more incredible? That same engine in a Ferrari F150 test car roaring around the track at Fiorano – giving us our best example of the new monster motor clearing its throat. For those who don’t know, Fiorano is Ferrari’s own test track in Italy where all of their vehicles undergo rigorous testing prior to ever reaching the hands of a private owner and this new video shows the Ferrari F150 in test mule form soaring along the road course. While the car still wears some awkward body panels to help keep the actual look of the upcoming Enzo successor secret until the car debuts, this video gives us our best chance yet to hear the 950 horsepower drivetrain in action in a variety of situations. The video shows the F150 test car accelerating hard coming out of a turn, decelerating hard as it enters a turn, roaring down a long straight and even grumbling through the non-track area around Fiorano. As you will see in the video, the driver is teasing both us and the camera man with seemingly only letting us hear the new Ferrari hybrid hypercar at less than wide open throttle but that doesn’t make it any less sweet sounding. 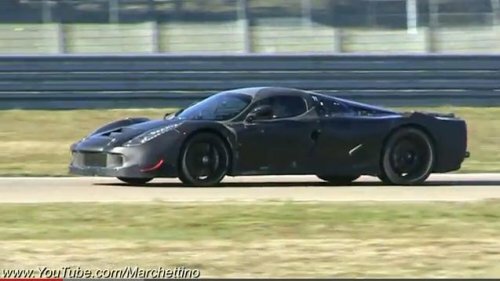 Best of all, this testing video of the Ferrari F150 in action on the Fiorano test track includes some footage of the Ferrari Enzo which it is set to replace going though many of the same driving situations. This gives us a good idea of the difference in the sound and characteristics of the 650hp V12 of the Enzo and the 950hp hybrid V12 of the F150. The F150 exhaust system is so powerful, so deep and so raspy that it actually makes the mighty Enzo sound apologetic as it drives away from the camera. Don’t get me wrong – the Enzo sounds absolutely awesome but when compared to the F150 test car shown in the video below, the bright red Enzo sounds far tamer. I’m left wondering if the exhaust setup at work in the video below will make it through to production when the F150 debuts or if we are hearing an opened up version but with the incredible exhaust tones of vehicles like the Lamborghini Aventador LP700-4, Ferrari very well could unveil the F150 with an exhaust system this incredibly loud. The video below also gives us a great chance to hear the high performance dual clutch transmission of the new Ferrari hypercar in action, popping down through the gears as the driver enters a series of sharp turns on Fiorano. Finally, it looks like the Ferrari F150 (or F70) test car may have the basic chassis of the production car and maybe even the same taillights based on what we have seen in official company teasers but across the front end, we see a distinctly test-duty front end with headlights that appear to be off of the Ferrari 458. At the same time, we can see that this test car has a very long tail that tapers down from a greenhouse that is set towards the front of the car. Still image above captured from the video found on the Supercars Videos by Marchettino YouTube page. Click here to check out all of his incredible supercar videos.